I have known and have communicated with Jeff many times over the years. 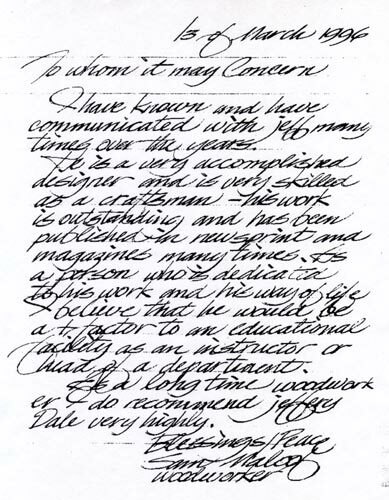 He is a very accomplished designer and is very skilled as a craftsman - his work is outstanding and has been published in newsprint and magazines many times. As a person who is dedicated to his work and his way of life, I believe that he would be a positive factor to an educational facility as an instructor or head of a department. As a long-time woodworker, I do recommend Jeffrey Dale very highly.